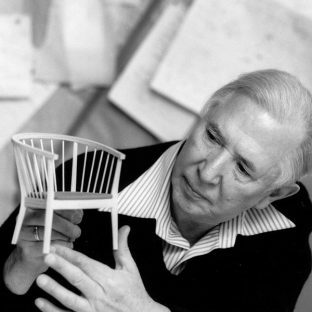 As a pioneer behind modern Danish furniture in the 1950’s and 1960’s, Hans J. Wegner was a driving force of change within the Mid Century era, wiith a career that boosts more than 1000 designs, his most notable designs were his chairs earning him, he is recognized worldwide which is reflected in his title ‘the Master of the Chair’. Wegner is reputable for his simplistic minimalist approach for integrating perfectly executed joints with refined shapes. He took this approach and combined them with a consistent enthusiasm for materials and a further appreciation for wood and its natural characteristics. Such iconic peices that has made Wegner the ‘Master Of The Chair’ are designs such as the Wishbone chair, Shell Chair, Plank Chair and The Papa Bear Chair, the chair received its name after a critic had referred to its armrests as ‘great bear paws embracing you from behind’. In the later years, The Papa Bear Chair has been one of the most popular Wegner designs of all. Wegner’s designs were manufactured by several manufacturers, including Getama, AP Stolen, Johannes Hansen, Andreas Tuck, Ry Mobler, Fredericia Stolefabrik, Carl Hansen & Sons, Fritz Hansen, PP Mobler and Erik Jorgense. Hans J. Wegner is considered one of the most creative and productive Danish furniture designers of all time, this has earnt him several accolades given to designers, including the Lunning Prize in 1951 and The 8th International Design Award in 1997. Wegner is considred one of the most influential designers in Danish Modern Design.